The charging port is on the backside of the light, underneath a rubber gasket. The gasket must be removed to charge the light, and is held in place by four small plastic pegs. Every time you want to charge the light, you have to peel the rubber off, charge the light, then reinstall the gasket. You also need to keep track of the rubber mounting strap and the gasket. If you were to lose them, you could order a new strap from Cateye, but they don't sell the gasket in their small parts store. The gasket is also prone to falling off when the light isn't mounted to a bike. 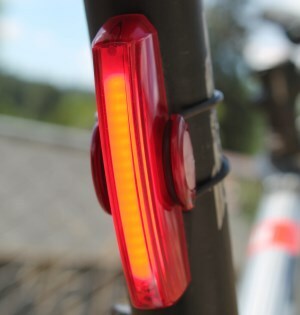 Ultimately, it's a terrible design for anybody who wants to take their light with them when locking up their bike. 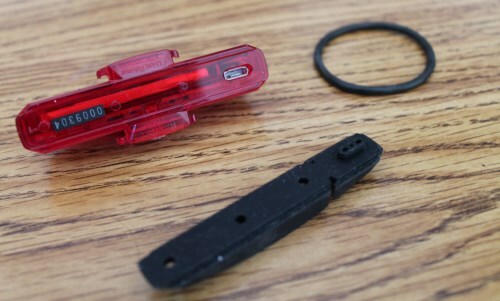 You have 3 different pieces to keep track of, two of which are small pieces of rubber which can easily be lost. Wrapping the rubber O-ring around the light can keep the gasket in place, but is still inconvenient relative to many other mounting systems. The actual light itself is not very bright – it's certainly less bright than previous lights in the Rapid series. Measured with an integrating sphere, the light puts out only 14 lumens in the steady mode. It does have decent side visibility when mounted vertically, although the shape of the beam is such that a lot of light ends up shining above and below the bike, instead of to the sides. 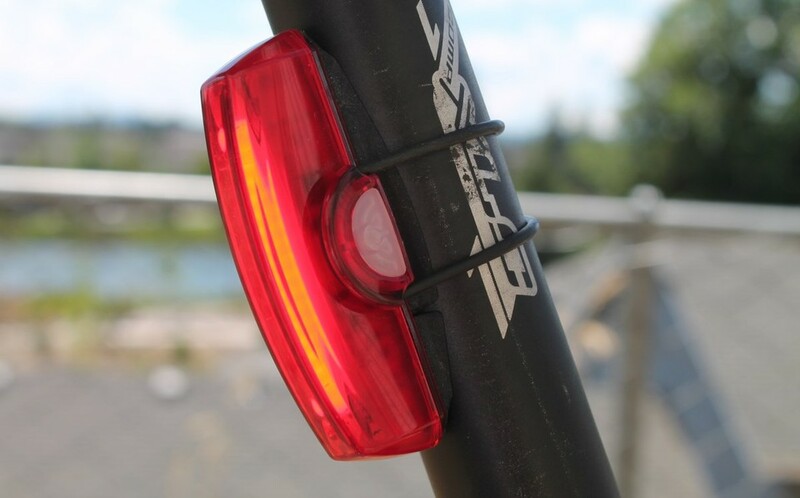 The light is bright enough to provide visibility at night, but don't expect to be seen during the day. Several flash patterns are offered, including some strobing options and a more subtle pulsing option. In the highest steady-burn mode, the light only lasted 30 minutes before going into the low battery flash state. When the battery gets low, the light automatically switches to a low-power flashing mode to ensure you'll get home. It's a good thing this mode is included, since the light probably won't last on high power for a full ride. If you only use the light in flashing mode, Cateye states it should last for about 30 hours which is decent; however, other lights with better battery life last easily 4 hours on a brighter steady-burn mode, and over a week in flashing mode. Overall, I was very disappointed with the Rapid X, and expected more from Cateye given the quality of their other lights. The Rapid X feels like a poor attempt at copying the Serfas Thunderbolt, but isn't as bright, is harder to mount, has way less battery life, and simply feels cheaper. The only real advantage this light has going for it is the low weight. If you're usually a daytime rider and just want something to get you home if you're out a bit later than expected, the Rapid X could do the trick without adding much weight. But at $40, there are many other lights that provide vastly superior performance and are much easier to setup and use.